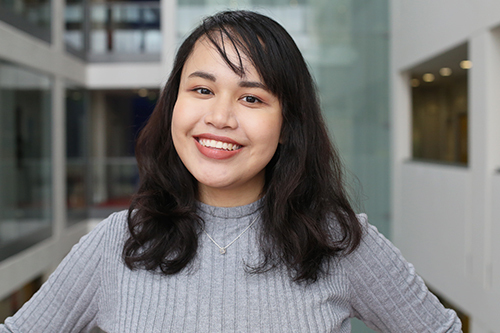 Izlin is studying the MSc in Energy and Environmental Technology and Economics at City. For her, learning is a never-ending journey. The first, very cliché but very relevant, relates to knowledge. After 4 years of being shoved of knowledge, to suddenly stop that and go straight into the working world made me suddenly realise that there is much more to learn and I want to stay back just a little bit longer. Also, the economy is growing fast and we have to be faster. I believe that by undertaking a master’s degree in something slightly different to my bachelor’s degree will give me better opportunities in the job market when I graduate. Finally, I wanted to make my parents proud. When they found out I got accepted at City, they were overjoyed. My lecturers at Malaysia also encouraged me to push myself before putting myself out in the market. The first thing that influenced the decision was the overall cost including accommodation and daily spending. Location was also another significant factor: not only was I not going to be at home for a year, I would have been in an entirely new environment - away from my country. However, my family, friends and lecturers back at home strongly encouraged and supported me. Studying in the UK as a non-EU student is not cheap, especially in London. However I secured a part-time job and even participated in some of the paid advertised psychology researches around the university. Since I have some friends who have studied here before, I asked them to make a list of the things that are cheaper to buy in Malaysia so that I could bring them over. I frequently look out for promotions and sales at supermarkets and shops. Time management was also challenging for me. Especially when studying a taught course, you have to balance the amount of time you put into your thesis as well as your assignments. Although the time in between classes can be long, without time management, I’d probably be in haywire. It definitely helps making a list of what you have to do and make sure the list is easy to get to. Another tip is to get a friend who is very good with their time keeping. Of course you cannot depend entirely on them to help you out so set alarms for everything if you have to. Finally, although I’m not new from staying away from home for long periods at a time, I’ve never felt homesick before, maybe because I was still in Malaysia. I think the thing that made me feel the most at home was probably the food. I had learnt a lot of home cooked recipes from my cousin and mum and tried to mimic them here. It also helped that London has some nice Malaysian restaurants around. If I missed speaking Malay, I would ring up anyone from the Malaysian Society at City and take a day off with them and that would make me feel more relaxed. Of course nothing beats talking to your parents when you feel lonely. I got interested in studying more on renewable energy but at the same time I wanted to learn more on economics and management. I was torn between wanting to continue the path of an engineering based degree or go directly for a business one. I was glad to find that City offered a course that combined both. It helped that City was located in London. London is a good place to study as well as network as there are a lot of things accessible in London. There are also a lot of international events happening here as well, so everyone is welcome. It has been eye opening from the start. I love the energy City students and staff tend to give off. There’s also something new to look forward to along the City hallways as well as the Food Hall. I find myself going to campus even if I don’t have any class simply because it makes me more motivated to study. I was pleasantly surprised when I saw that City provided prayer as well as multi-faith spaces for their students. As a Muslim, I am very glad I did not have to miss prayers due to lack of facility. The computers around the library and informal study area are easily accessible to students and staff, and they are great for those who do not have a laptop. I also love exercise classes such as Zumba and martial arts that are offered here. It encourages students to balance out their health in the midst of studying. Professionally, in my undergraduate studies, I viewed things from an engineering perspective without thinking too much about the financial side as much. Outside of my comfort zone of purely engineering, it helped me understand the world from a whole different angle. Personally, since my classmates come from many different countries and I had no Malaysians around me to “cozy up” to, I was pushed to go beyond my comfort zone and interact with everyone. 1) Critical thinking skills: As the course focuses on ways to reduce global emissions, we have to come up with methods that are more than just elaborating on about renewable energy. The classes are always intensive and exciting as small debates and discussions are always brought up. 2) Presentation skills: After a module, we get feedback from lecturers that can help us identify area where we can do better, whether it is in the information presented or our general presenting skills. This has helped me improve on my future presentations within City and externally. 3) Teamwork skills: Every module has a group project and members are randomly selected so everyone has a chance to work with each other. This has given me the opportunity to interact with people from different backgrounds, be it engineering or economics, and work together to solve a problem from different perspectives. In terms of knowledge, as we got people from industries coming in to lecture us, we are always updated on the latest developments in the field so we can expand our understanding beyond the information available from textbooks. Studying on clean and alternative energy, module leaders such as Professor Abdulnaser Sayma and Professor Martin Fry had arranged field trips for the whole class so instead of hearing only about topics in theory, we get to see it and learn it from the sites visit. We even visited a district heating company that was right in the middle of Islington and was even given a presentation of how they ran and what operations they did. This motivated me to want to try to implement that idea in Malaysia as well. What advice would you give to people thinking about postgraduate study? There will be people who will tell you it's a waste of time, especially when you have entered the industry. It is not a waste of time especially if you have a passion for learning. You always have to give yourself time to grow. As a fresh graduate, you may be concerned about not being able to catch up with undergraduates who have already secured a job while you’re still doing your master’s degree but your decision will eventually pay off. Studying a master’s will also open up for you other opportunities such as getting to meet company directors when they give you lectures, or when you attend one of their career talks. I plan to go back to Malaysia once I am done with my studies to implement everything I have learnt here and hopefully contribute to my country development especially in terms of renewable energy. I also plan to get an internship placement or practice job shadowing before I leave the UK. Though it is not mandatory, City has encouraged students to join their employability programmes. I have gained a lot and met speakers of whom I am now connected with professionally. It also allowed me to keep myself up to date with what’s happening outside of City’s walls. Group work and presentation activities in my course have also helped me improve these skills so I feel better prepared for the future in dealing with projects that involve teamwork with people from different backgrounds.